An innovative new product called Tembo Trunks has started its campaign to become a real word product on Kickstarter. 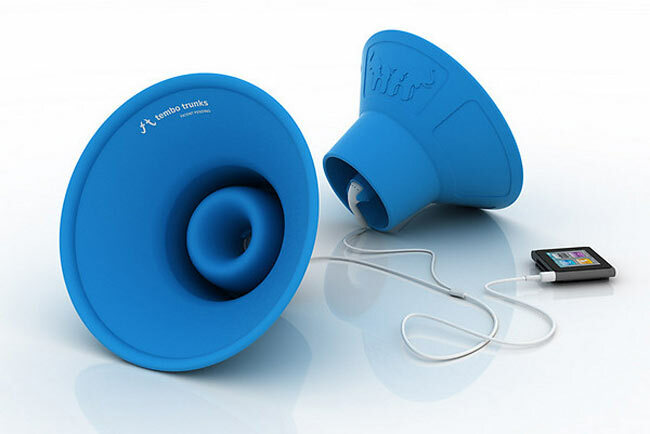 Tembo Trunks are a amplifiers designed to be used with your Apple earbud headphones. Simply insert each earbud into the back of the Tembo Trunks and your audio is amplified without the need for any extra power and can be collapsed and even stacked for easy storage when not in use. The campaign is already off to an impressive started with the design passing it initial pledge of $10,000 and currently raised $21,230 at the time of writing this article. Tembo Trunks have been designed to be robust and are made from 100% non oil-based, high-grade silicone rubber, requiring no assembly to use. The silicone rubber used in construction makes the Tembo Trunks very hard wearing and they are 100% Waterproof, Shockproof, and Dustproof, and contain no moving parts or electronic components to fail. Check out the Kickstarter page for more information and a video of the Tembo Trunks in action, and as always don’t forgot to make a pledge.